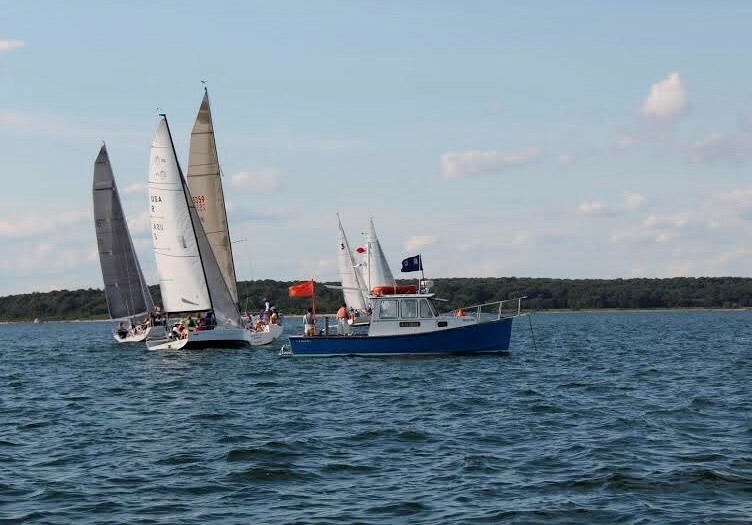 The 2015 Junior Overnight Race, hosted by Fishers Island Yacht Club and the Storm Trysail Club, started at 1735 on Friday, August 7 in 8-10 knots from the east and foul current in Fishers Island Sound off Sea Flower Reef. The Pettipaug YC/MudRatz team sailed Quantum Leap to victory in the 2015 Fishers Island Junior Overnight Race. The starters ranged from Paul Hughes’ Henderson 30 Double Down, rating 45 in ECSA PHRF, sailed by a Pettipaug Yacht Club crew led by 15-year-old watch captains Zach Champney and Alex Hughes, to Irukandji, Peter Rugg’s 1982 Beneteau 32.5 (rating 138) skippered by Hallie Bereday, age 16, from Fishers Island Yacht Club. The crews of these two boats at the far ends of the rating spectrum enjoyed close racing, and the battle of the leadmine and the sled lasted all night into a bright dawn 12 hours later, and ended with a corrected time margin of just 5 minutes, 45 seconds. The course took the five entrants, each with an owner’s representative and safety officer aboard, over 70 miles through the waters of three states: eastward through Fishers Island Sound (NY), around Bell R2, South of Point Judith (RI), then west to Flasher G7 by Shagwon Reef near Montauk, NY, then northwest to Flasher R4 off Bartlett Reef (CT) followed by a port tack close reach to the finish at Sea Flower, off New London, CT. The overall winner was Pat Dillon’s Quest 30 Quantum Leap, the winner of the 2013 edition of this race, captained by Lawrence Hennessy and crewed by a team from Pettipaug and MudRatz. Hallie Bereday steered Irukandji to second place second, followed closely by Double Down in third. 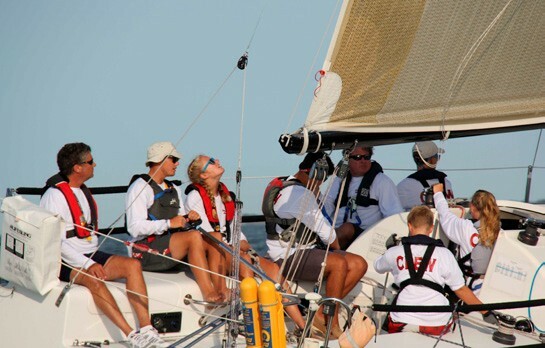 Kevin Farrar’s GP 26 Pithy (FIYC), skippered by Hallie’s twin brother Jarvis Bereday, took fourth. Justin Dieckerhoff’s J/105 She’s The Boss, sailed by a team from the Wadawanuck Club led by skipper Charlie Mann, was fifth. There were many siblings out for the night, and Lawrence Hennessy’s sister Kathleen, aboard Quantum Leap, won the best Navigator Trophy. The Navigator Trophy selection committee was led by world-renowned navigator and marine physicist Frank Bohlen. A longtime Storm Trysail member, Bohlen has coached Newport Bermuda Race navigators for more than a decade and sailed enough ocean miles to commence salt mining. At the awards ceremony, he coached the navigators on how to hone their skills and step up to the next opportunity. All five teams completed the 70-mile course. Additionally, each of the participants learned and practiced safety skills at a Storm Trysail Foundation Junior Safety-at-Sea Seminar hosted by the New England Science and Sailing Foundation in Stonington, CT in July. For more information, visit yachtscoring.com. To get involved in the growth of this exciting and challenging junior big boat race, contact Peter Rugg at ruglet@peterrugg.com.